(Originally recorded on 4/23/2016) What a weekend! Somehow Andrew and I were able to find some time with a few other guests and talk about what’s been going on this weekend from the convention. This is an unedited and “un-raw” cut. Still it was a lot of fun recording and you can hear how ridiculously tired I was. What the heck is unraw? I honestly haven’t heard the clip in it’s entirety. I got home and I just uploaded it. So if there is something terrible in it, then oops. Otherwise, enjoy the show! I know we talked about it last week, but this week we’ve got Chase to give the full details about what it’s like putting together the show at PAX East. It’s a lot of work, but well worth the effort. 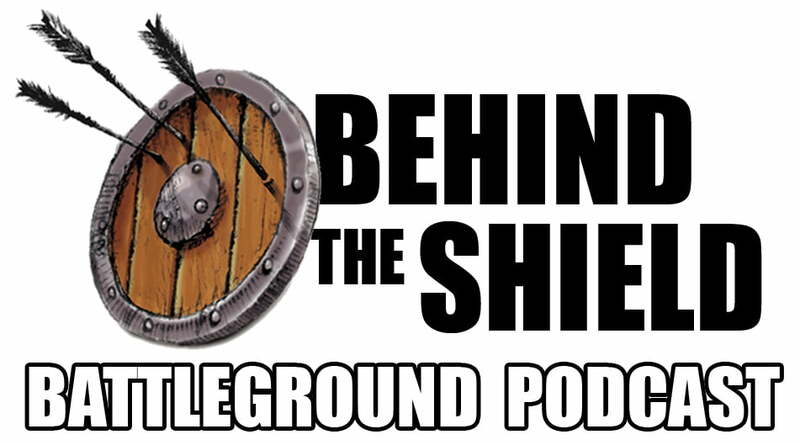 And if you’re interested in getting a spot on the crew to help out, then take a listen to this week’s episode! Big shout out to Josh Warren! We love you, man! Wizards of the Coast announced at this year’s PAX East, during the popular Magic panel, the title and details for the first release in the revamped two block set format for its Magic: The Gathering CCG. Battle for Zendikar releases on October 2. Battle for Zendikar is the first in the new two block, twice-a-year format announced last year. The 274-card set will be released on October 2, with pre-release events held on September 26-27. The official Battle for Zendikar Game Day is set for October 24-25, and Magic Online release is slated for October 12. The set will be available in Booster Packs, Intro Packs, Fat Packs, and Event Decks. The initial concept and game design team was led by Mark Roasewater, and included Ian Duke, Dan Emmons, Ethan Fleischer, Dave Duskin, and Ari Levitch. Erik Lauer was lead on the final game design and development team, which included Tim Aten, Kelly Digges, Ian Duke, Ben Hayes, Shawn Main, Yoni Skolnik and contributions from Matt Tabak. This set will follow the new Modern Masters set arriving to Battleground Games & Hobbies in May. Don’t forget – the new Magic The Gathering: Arena of the Planeswalkers board game arrives at Battleground Games & Hobbies this summer. Welcome back to another issue of “This week in gaming.” As you may have noticed we weren’t around last week, and there was a good reason for that. 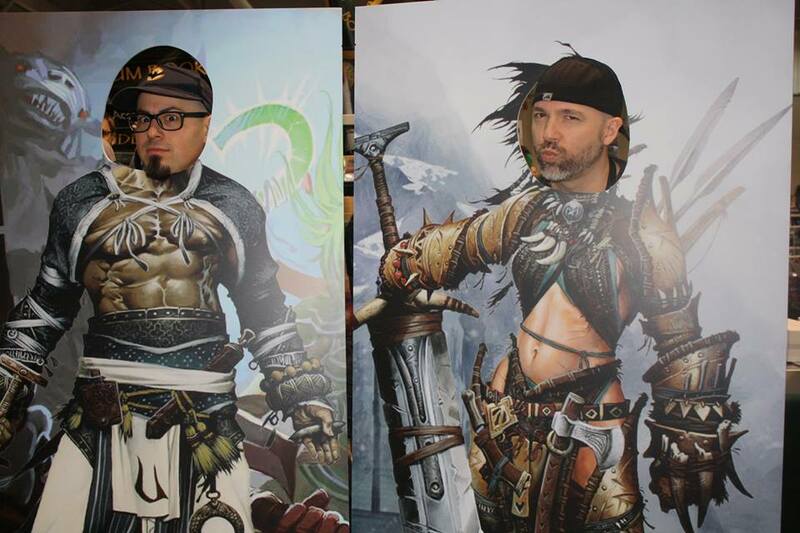 Some of us were a little busy getting ready for PAX East 2015. I’ve been going to PAX East since the first time it came to Boston in 2011. If you weren’t there for the first year, it was actually held at the Hynes Convention Center located on Boylston St. in Boston. If you complain about the limited space on the exhibit floor now, it was crazy back then when the convention was at the Hynes. 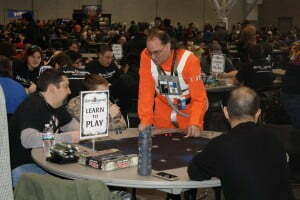 There also wasn’t much of a tabletop area as well. With the exception of the exhibit hall, it seemed like everything was jumbled. The year it was announced that everything was being moved to the BCEC was a great welcome. 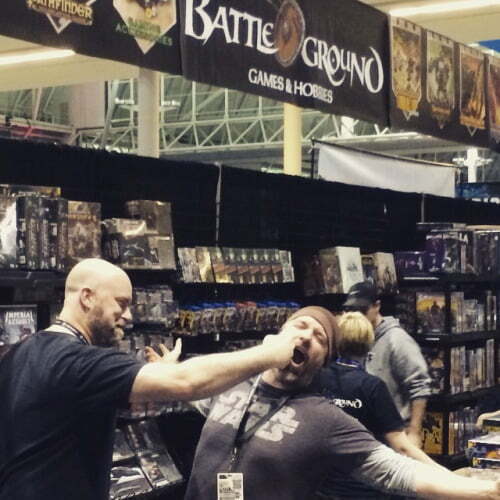 The first year at the BCEC was also first year that Battleground had gone as a vendor and has been there ever since; each year getting bigger and bigger. If you’ve never been to one of these events before, then I highly recommend it. From 10AM – 6PM you can browse some of the major AAA titles that have already come out or a slated to come out. Afterwards, as a thank you, the company will give you some free swag in the form of a T-shirt, stickers, or even another game. Sure, 10AM – 6PM doesn’t seem like a lot of time, but have no fear. 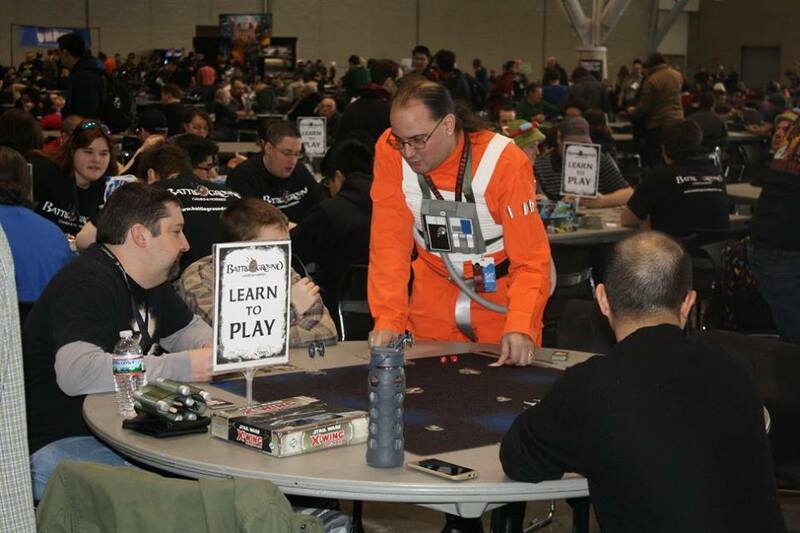 From the exhibition hall to the tabletop area, this place doesn’t close until midnight. So learn a new game or play one you’ve always loved. This was my third year doing media coverage. The past few years I had been so busy for me conducting interviews and other activities that I had become too busy to stick my face in the tabletop area. However, I was lucky enough to keep a light schedule. I got to learn a few games I’ve been wanting to learn and hang out with the BG crew most of the weekend. One of those games I learned was Splendor. First thing, don’t be fooled by the look of this game. It looks pretty simple, but there is quite a bit of thinking involved in the game. Additionally, the mechanics of the game randomize it to the point that each game will be a little different – so different that there is no set strategy. 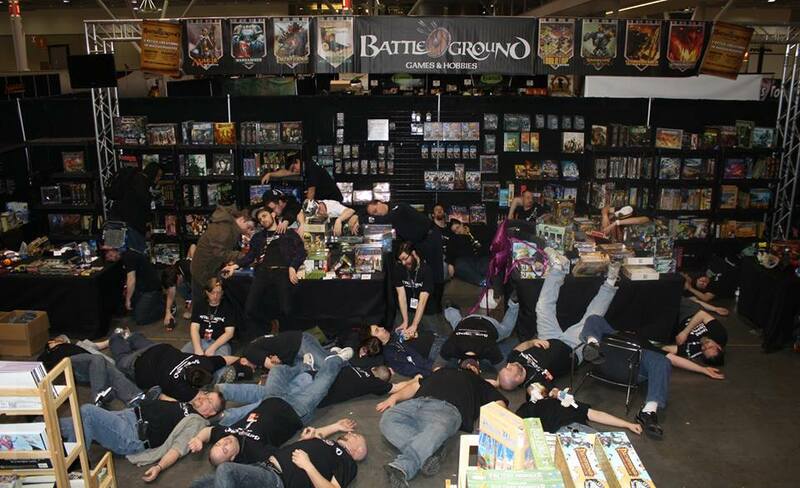 There is probably some bias in this statement, but one of the best sights at PAX East has to be the Arena that Battleground Games breaks out for this special occasion. It was so popular one year that it made it’s way into Penny Arcade’s own gaming publication. What makes it so popular, besides the sight of the Arena, has the to be those who host the games throughout the day and night. It’s completely free to enter. You can participate by either using one of the beginner level figures or purchasing a Dungeons and Dragons booster pack and using one of the figures you pull from the box. 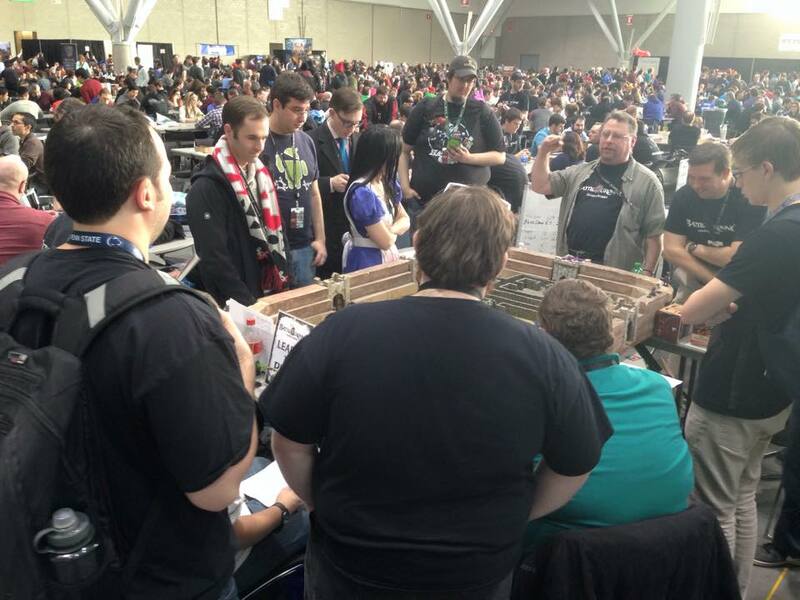 I feel that this year’s PAX East was one of the most successful years for the store. Although, ultimately, you’ll have to ask Derek that question. Still, you can’t deny that there were a lot of people (probably the most I have seen in all of the years Battleground Games has been there) demoing games from the time the doors opened up until the enforcers reminded you that there was only 30 minutes left remaining in the tabletop area. If you still haven’t been to one of these yet, what are you waiting for? You’re lucky that the convention has committed itself to Boston until 2023, so there is plenty of time. Until then enjoy some photos that were taken at the convention. Hope to see you all there next year! This week in gaming: Happy Anniversary! 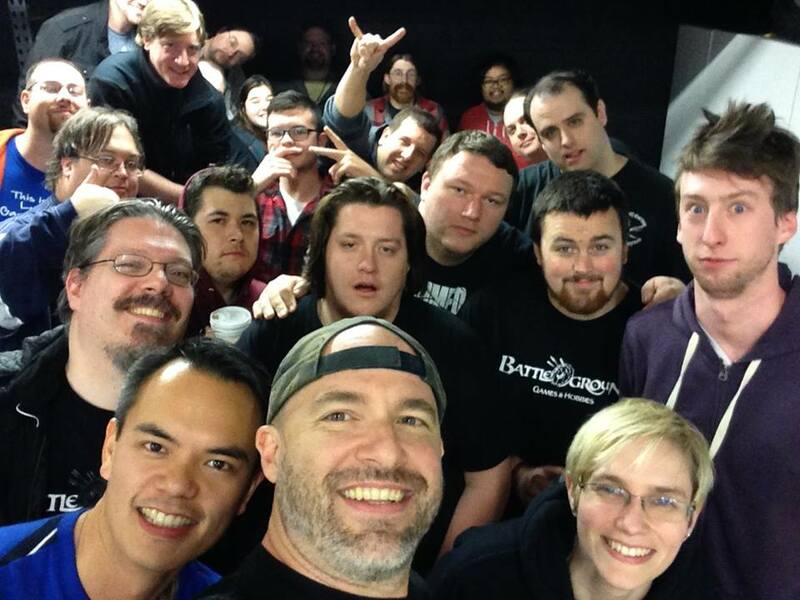 Welcome to another edition of “This week in gaming.” Earlier this month was the one year anniversary of when I started writing for the Battleground Games website. For this week’s issue, I’d like to go over some of the content we’ve gone over and maybe where the future of this column could lead to. Don’t get me wrong. I would love to cover more gaming topics for everyone out there. In fact, there has already been some talk about this. 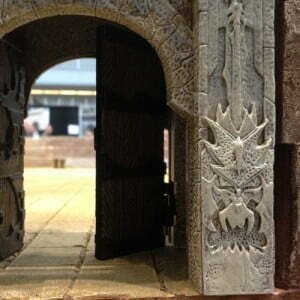 If all goes well, you may be seeing more topics in Dungeons and Dragons as well as more product reviews coming your way. Something I’d, personally, like to see is more variety in the voices we read here on the site. With that said, I’m always looking for more people to write. We’ve already have some guest work done by local gamer, Ken Briscoe. We’ve also had a few tournament reports done by some of our local players. I think we can get more. Consider this an open invitation. If you’re a local player and would like to try your hand at this, let me know. I’m sure by now people are sick of reading about Mono Red Burn. While it may not be the only deck I know how to play, I do tend to write about it a lot. Are you experienced in Modern RUG Twin? Maybe you consider yourself more of an expert in the Limited format. If the only thing holding you back is that you think you stink at writing, let me tell you that you have nothing to worry about. That’s what I’m here for. I’m not the solution to everything, but I will be there to help edit your writing. I think it’s been a pretty successful year writing for the website. My biggest hope is that many of you have been repeat customers. Somewhere along the way, I hope you’ve spread the word and told your friends about the kind of content you can find here. I started writing for the website in the beginning of February. It wasn’t until the end of May where I had established a title for the weekly article I had been contributing. I’m glad I had finally come up with a name for the column. Don’t get me wrong, I didn’t mind coming up with a title every week. By adding a formal name for the column, it gives it some uniformity. In addition, when things really get rolling on the site, it will give the column a confirmed identity from among the other weekly columns that may develop. 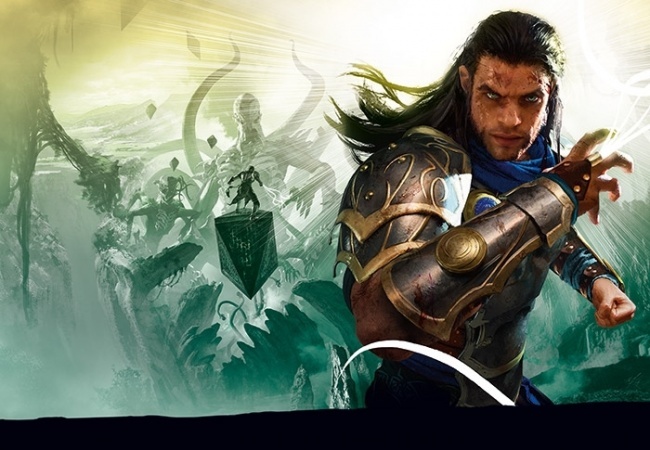 In the many months I’ve been writing this column, I’ve covered mostly “Magic: The Gathering.” I’ve also written a few product reviews as well as a few general gaming news roundups. One thing I’d like to try is writing a story. I don’t mean to come up with one on the spot. What I would really like to do (or someone else could do it if they have one) is to recount a Dungeons and Dragons session. The catch is that they would have to do it in story form. I’d like to hear about it from the perspective of their character. Also, I want the whole experience. If there was a foul odor in the air, I want to know about it and what it smelled like. If I had to rank my articles, I think the best one would have to be “From couch to cash: Redefining the gamer stereotype.” That was an article that came very easily to me. I remember writing and not stopping for a bit to take a break. 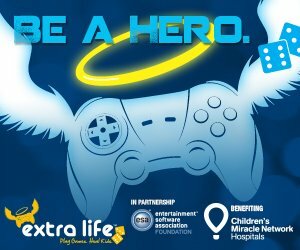 The best part about writing that article is that it lead to the Extra Life initiative and then eventually to all of us raising over $2500 in October of last year for the charity. I’m going to keep writing here, that’s for sure. I’d like to branch outside of Magic some more though. If you have any suggestions as to what you’d like to see from me, then let me know. I’m game for almost anything. PAX East is coming up in about two weeks. I’ll be doing media coverage for another outlet I write for, but I also intend on putting up some posts while the whole crew is out there. Whenever I’ve “worked” PAX, I’ve booked myself busy trying to meet with big wigs from the video game industry. This year, I’ve tried to keep an easy and free schedule so I can spend more time in the board game room. So, if you see me there, then stop by and say hello! It’s time to wrap things up, but before I leave I figured I’d say a few things regarding Extra Life 2015. Due to the fact that last year was such a huge success, we’re hoping to do it all again this year. In fact, I’ve already gotten things registered and people can go donate for the 2015 campaign as we speak. Additionally, I’ve set things up so we can put a Battleground Games & Hobbies team together. If you’re interested in more information regarding joining the team, then let me know. I’d be more than happy to fill you in. It’s still early in the year, so stay tuned because I’ll be doing an article covering my plans for this year’s event as well as some fundraising ideas and I’m going to need all of your help.